NEWPORT BEACH — Ross McKitrick, an economist at the University of Guelph near Toronto, Canada, and contributing writer with the Orange County Register, penned an opinion column in September 2014 titled “Climate Change and the False Case for Haste.” He pondered, in light of an upcoming United Nations Climate Summit, whether it was wise to advocate for immediate regulatory action to reduce greenhouse gas emissions. Managing climate change through perfectly timed legislation is an inexact science. 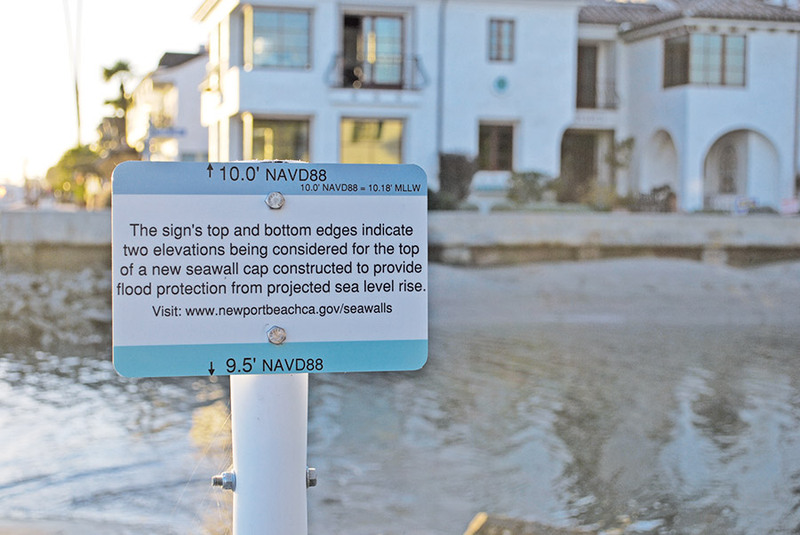 Yet, with early estimates indicating climate change could significantly alter Newport Harbor at some point between now and the year 2100, city officials and residents have begun a discussion of how – and when – to address issues such as sea-level rise. Newport Harbor is one of the largest yacht harbors in the United States and the homeport of thousands of recreational vessels. Climate change and rising sea-levels – while currently discussed primarily in the context of Balboa Island – will certainly have an impact on the local boating community. Whether the impact occurs sooner than later could be directly connected to when local, state and federal leaders enact climate change policy. The latest iteration of the climate change discussion in Newport Beach occurred during the first Harbor Commission meeting of 2015. Commissioners were updated Jan. 14 on the status of the Balboa Island seawalls. According to Bob Stein, a city engineer, their seawalls are showing early warning signs of deterioration and stress. Since they were built more than 75 years ago, the seawalls are also subject to seismic risk. “We’re kind of up against it now,” Stein told commissioners during the Jan. 14 meeting, citing a 2011 report that claims the existing seawalls have a useful life of 10 to 25 years. The sense of urgency is rooted in whether the seawalls would fend off significant flooding on Balboa Island, along Balboa Peninsula and in the Upper Bay. According to a projection published by the U.S. National Research Council in 2012, the California coast could experience a sea-level rise – which, according to studies, correlates with greenhouse gas emissions – between 16.5 and 66 inches by 2100. Sea-levels rose an average of 7 to 9 inches in the past 100 years, according to the California Coastal Commission. On Balboa Island, city officials said weather conditions and potential sea-level rise could result in about 2 to 3 feet of flooding by 2025 – exactly 10 years from now. As Newport Beach officials contemplate building an entirely new seawall around the island or finding a way to upgrade the current infrastructure, at some point the discussion will extend beyond Balboa Island and involve portions of Newport Harbor occupied by yacht clubs and boat owners. During the Jan. 14 Harbor Commission meeting, Stein told commissioners areas such as Balboa Peninsula and the Upper Bay would be subject to periodic flooding by 2064, if no protective measures are taken within a 50 years of 2014. Putting that time period in perspective, however, was Jamshed “Jim” Dastur, a Balboa Island resident who spent portions of his engineering career working on marine-theme construction projects. Specifically, Dastur said it is difficult to predict how the next 85 years would play out in terms of climate change. Accordingly, any action taken today should be flexible and leave room for adjustments to be made 20 to 25 years from now. A similar position was taken in McKitrick’s editorial a few months ago. He wrote now might not be the time to call for immediate reductions in greenhouse gas emissions, and an early start to addressing climate change does not necessarily result in environmentally friendly savings. He further stated the most effective way to address climate change is with global, not local, policy. Still, potential sea-level rise would directly impact coastal infrastructure such as harbors and marinas. The report also emphasized the need for local planning to address sea-level rise. “Planning for sea-level rise is a highly site-specific exercise. Community-by-community variations in geography and land use present disparities in the potential type and amount of damages, and differing adaption strategies will be needed to prepare for a rapidly changing climate,” the report stated. The state legislature formed the Assembly Select Committee on Sea-level Rise and the California Economy in 2013. Four hearings were held by the committee since its formation. The results of those hearings were published in August 2014. One of the report’s findings was that key segments of California’s economy, including ports, are at risk because of potential sea-level rise. The combination of sea-level rise and king tides poses a greater risk to harbors and key infrastructure, the report stated. “True vulnerability is sea-level rise plus extreme storms and king tides. King tides are especially high tides that occur several times each year. The combined effects of current sea-level rise combined with extreme storm events and king tides are already providing us with a preview of the new normal that can be expected as the seas continue to rise,” the report stated. Similar to the Cal Boating report, the select committee also urged early action. Barnard cited Newport Beach as a vulnerable coastal community. The San Diego Foundation recently published “A Regional Wake-Up Call,” a report studying sea-level rise and the impacts of climate change in San Diego County. The report predicts if current trends persist, sea level in San Diego County would rise 12 to 18 inches by 2050. A similar report published in 2012 by the International Council for Local Environmental Initiatives (ICLEI) cited a projection claiming sea-levels will rise 10 to 17 inches statewide by 2050 at the current pace of climate change. Infrastructure threatened by sea-level rise includes potable water and recreational facilities, according to the ICLEI report. Specifically, Coronado Cays and a portion of San Diego near Southwestern Yacht Club were listed as potential areas of concern. However, the report also stated marinas could have a lower sensitivity to sea-level rise. “Some marinas may have somewhat lower sensitivity if floating docks are not impaired and boats can be accessed,” the report stated. Jim Titus, who directs the Sea-level Rise project for the Environmental Protection Agency and published a report on the impacts of sea-level rise on transportation, said rising sea-levels could actually make it easier for deep-draft vessels to navigate certain channels. “Sea-level rise makes water deeper, which enables deeper-draft vessels to navigate a particular channel. This effect, however, is fairly small compared with the draft of most vessels,” Titus said. “Saltwater advancing upstream can alter the point at which flocculation leads to sedimentation and the creation of shoals. Similarly, the clearance under bridges decreases. How projected sea-level rise would ultimately impact the local boating communities of Southern California and when communities such as Newport Beach will make changes to their coastal and harbor infrastructure remains to be seen.